Cartoonist&apos;s Note: While I take time away from drawing to organize the Association of American Editorial Cartoonists http://editorialcartoonists.com/aaecweb/convention.cfm, I am featuring the work of some attendees. 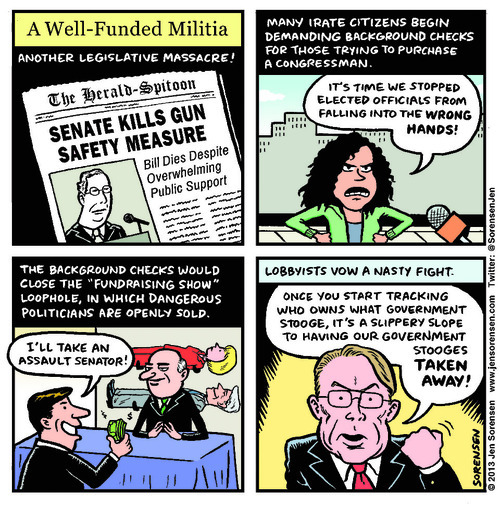 Jen Sorensen is an "alt-weekly" cartoonist out of Austin, TX . Her work appears locally in the "Salt Lake City Weekly". Despite some progress, cartooning is still a profession with binders full of men. Whether comics or editorial, men dominate the profession. Go ahead and take a look at the comics page in today&apos;s Tribune. By my count female cartoonists are outnumbered twenty to one. It&apos;s about the same ratio within the AAEC. Why this is so is beyond me. In the old days women ran up against cultural and institutional roadblocks in the newsroom. When I started at the paper the few women on staff were secretaries or worked on the Society section. Today, by contrast, the newsroom is a pretty even mix and gender is not a barrier to any position in the paper. The AAEC is hosting art workshops for children with The Leonardo, The Natural History Museum of Utah, and the SLC Library. You can find the dates and times on their websites. Don&apos;t forget to bring the girls.